Cohort analysis is a subset of behavioral analytics that takes the user data and breaks them into related groups for analysis. 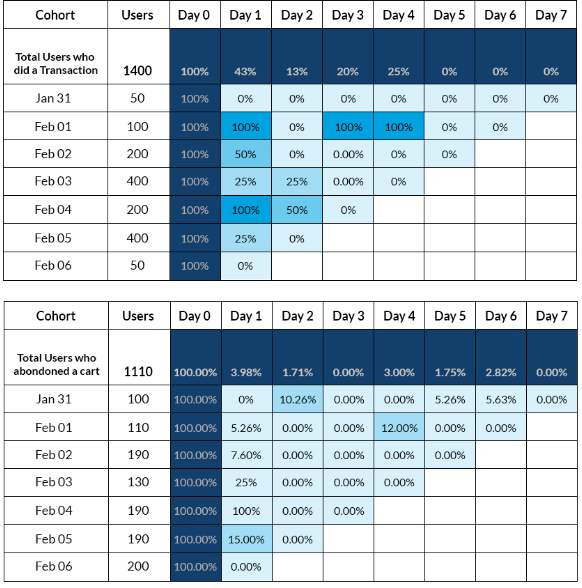 Let’s understand using cohort analysis with an example of daily cohort of app users. Revisiting the above daily cohort – which is an acquisition cohort. One way to visualize this information is to chart out a retention curve, showing the retention of these cohorts over time. The chart makes incredibly easy to infer when users are leaving your product. This retention curve immediately reflects an important insight – about 75% of the users stop using the app after the 1st day. After that initial large drop, a second brisk drop occurs after 5th day – to under 12%, before the curve starts to level off after 7th day, leaving about 11% of original users still active in the app at day 10. The above retention curve indicates that users are not getting quickly to the core value of the app, resulting in drop-offs. Hence, it’s evident to improve the on-boarding experience to get the user to the core value as quickly as possible, thereby boosting the retention. An app user, after an app install and / or launch, makes hundreds of decisions and exhibit countless little behaviors that lead towards their decision to stay or go. These behaviors could be anything, like, using core feature Y but not using core feature Z, engaging only with notifications of type X, and so on. Both user segments had the intention to transact on your app. But one user segment chose to proceed with the checkout, the other choose to abandon your app. What you can do to reduce the shopping cart abandonment? When is the best time to re-engage with your users? When is the best time for remarketing? What is the rate of acquisition of new users to maintain (if not increase) your app conversion rate? From the above retention tables, you can conclude that majority of the users who had abandoned the shopping cart did not engage with the app again, not even 1 day after the acquisition date. So, you have less than 24 hours to re-target them with the new offer and increase the chances of getting revenue. From this data, you can develop a systematic, quantitative approach to know how users can fall in love with your app – and then make it happen again and again. Also, you can make strategies to increase your retention after ascertaining what works and what doesn’t. The power of cohort analysis lies in the fact that, it enables not only to view which customers leave and when they leave, but also to understand why the customers leave your app – so that you can fix it. That’s how one can identify how well the users are being retained and also determine the primary factors driving the growth, engagement and revenue for the app. What is the influence of Big Data in Medicine?